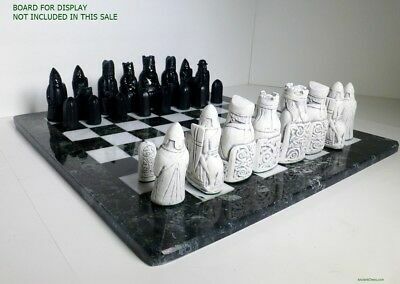 Seller: nordikfolk (268) 95.6%, Location: Hammond, Indiana, Ships to: US & many other countries, Item: 113701799228 Isle Of Lewis Chessmen They come in Black & Natural or if you request Deep Red & Natural DISPLAY BOARD NOT INCLUDED (Check my shop for handmade Chessboards) They are full size reproductions, not the smaller set sold everywhere else. 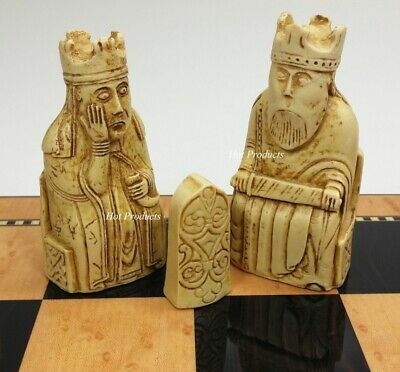 The King is 4 inches tall, as seen on the right, compared to the smaller size seen on the left with the 3.5 inch King sold by everyone else. Also shown is the smaller Night compared to the much larger one on the right included in this set. All the pieces in this set are full size reproductions that are hard to find anywhere else. 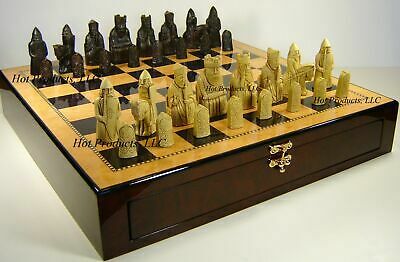 Set includes 32 pieces, four different Rooks with two very hard to find Berserkers, two different Kings, Queens, Bishops, Pawns and Nights. A special Chess Set that will become a family heirloom handed down from generation to generation. 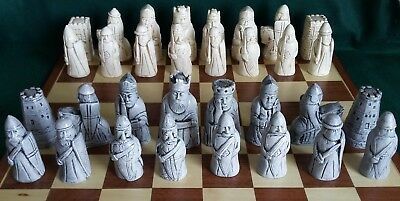 The Isle of Lewis Chessmen are the most interesting Chessmen in the world with their elaborately carvings in the form of seated kings and queens, bishops, knights on their mounts, standing warders and pawns in the shape of obelisks. From start to finish my sets are hand crafted with attention to detail. Each time I make a set I never know were its going, could be a stranger, family or the closest of friends. 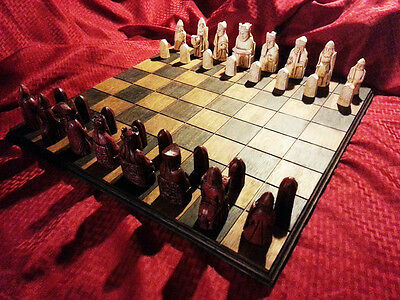 I take a lot of time and pride in my work, anyone who owns a set of Chessmen I created will tell you the same. 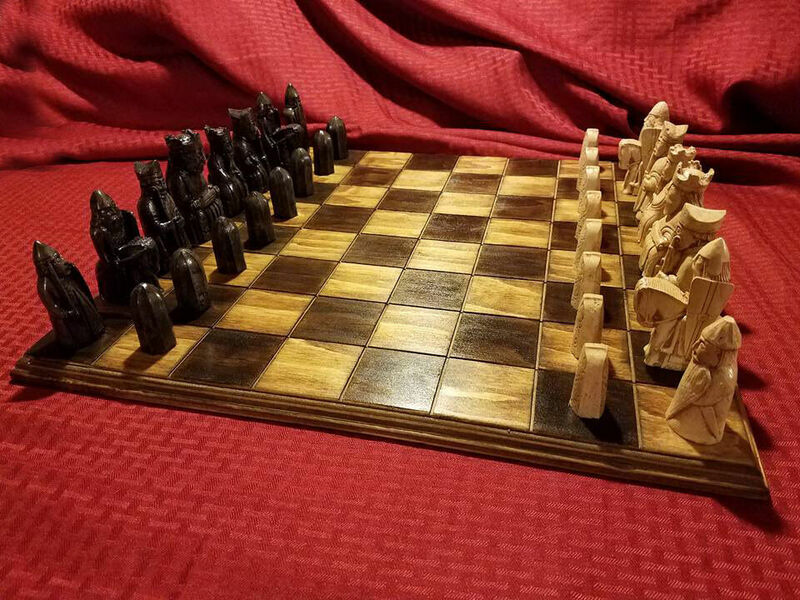 There is no other set on the market today that shows better craftsmanship than the sets I make. 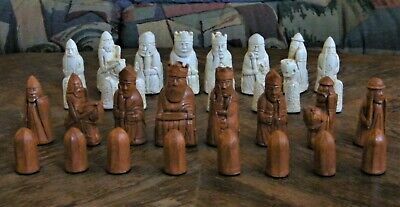 Thanks for considering this fine set of Chessmen, The Isle of Lewis Chessmen HISTORY Like magical creatures from Norse mythology, the Lewis Chessmen seemingly appeared out of nowhere. 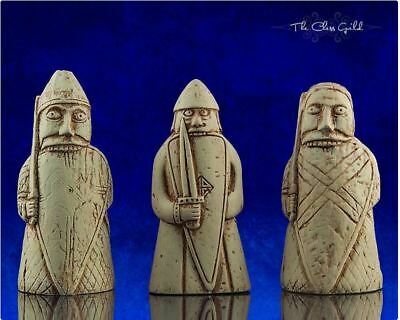 The miniature figurines were discovered on a remote island in Scotland’s Outer Hebrides sometime before their first public display in 1831, but no one knows exactly when they were found. 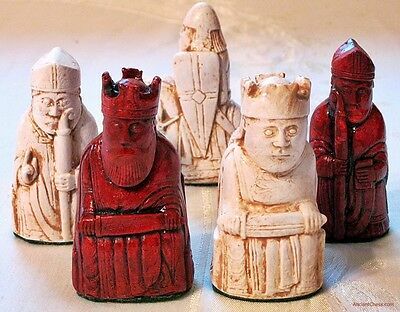 Scholars are also unsure of just who carved the 12th-century chess pieces that are between 1 and 4 inches tall. 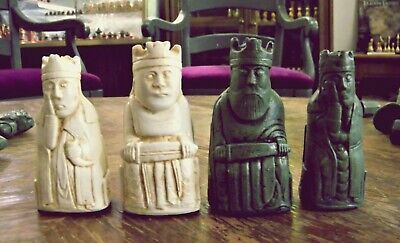 What isn’t up for debate, however, is that for such tiny figures, the Lewis Chessmen have spawned a giant historical mystery. Even the story of how the world’s most famous chess pieces were discovered on the windswept Isle of Lewis sometime in the 1700s or 1800s is shrouded in a mystery as thick as the fog that often cloaks the mountains and moors of the rugged island in far northwest Scotland. According to contradictory accounts, the Lewis Chessmen were found exposed on a beach following a fierce storm, buried 15 feet underground in a stone container or inside a vaulted room of an ancient nunnery. Some even credit bovine intervention—although there are conflicting stories as to whether a cow dug the chess pieces out of the sand with its horn or happened upon them after falling down a hole. The hoard found on the Isle of Lewis included 78 chess pieces, 14 plain discs that could have been used for another tabletop game and one buckle that might have been from a bag that once contained them. 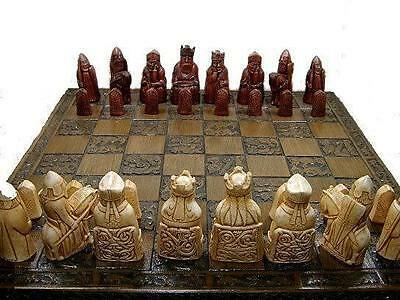 The figures could be part of as many as five chess sets. 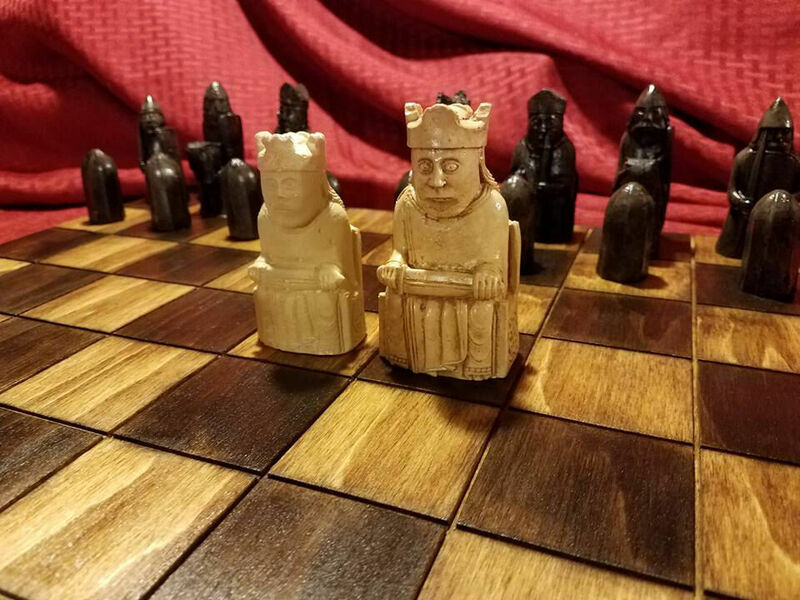 Although the pawns are simple geometric shapes, the other pieces are intricately carved human figures with almost comic appearances that include bulging eyes and expressive faces. 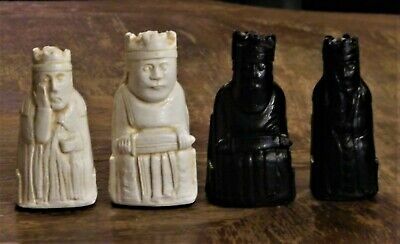 Stout kings sit stoically on their thrones, while queens raise their right hands to their jaws in looks of shock or grief. Knights astride small horses brandish spears and shields. 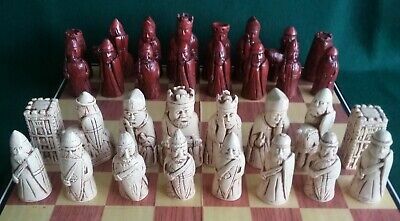 In the earliest known instances of bishops in a chess set, the religious figures clasp ceremonial crooks to their cheeks as they raise their hands in blessing. 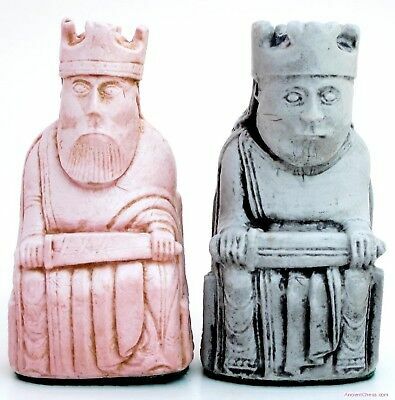 Although scholars can’t definitively say when the Lewis Chessmen were carved, the style matches other objects that have been conclusively dated to between A.D. 1150 and 1200, just after the end of the Viking Age and a time when Norway still ruled the Outer Hebrides. Also, the tall miters sported by the bishops have their points in the front and back, an ecclesiastical fashion that did not begin until around 1150. (Prior to that, bishops wore miter points on the sides, which gave them the unfortunate appearance of having horns sprouting from their heads.) 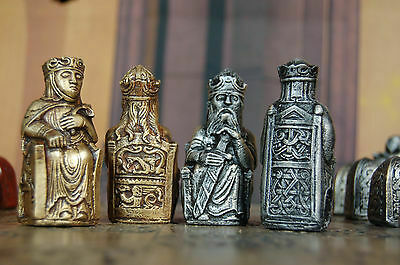 The ornamentations of the Lewis Chessmen are distinctively Scandinavian, but which Nordic country is responsible for their creation remains unknown. 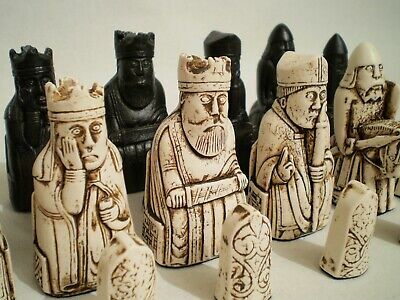 “Instead of facts about these chessmen, we have clues,” writes Nancy Marie Brown in her book. 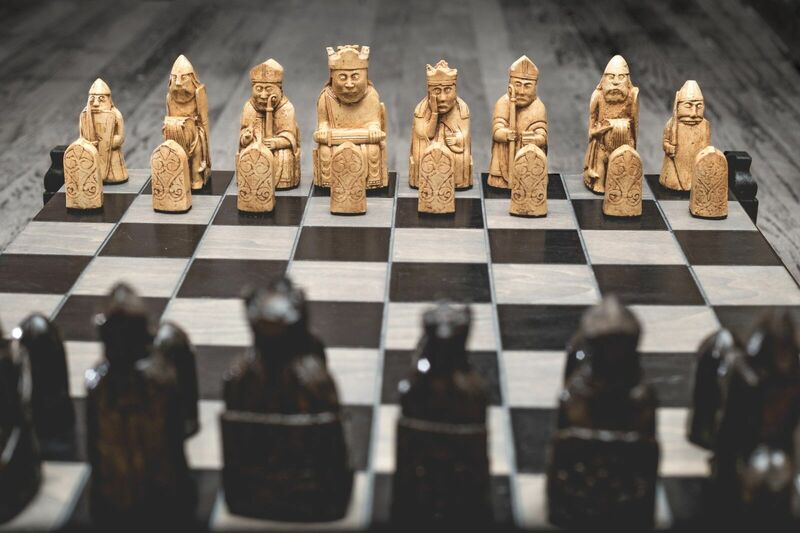 The Mystery of the Most Famous Chessmen in the World and the Woman Who Made Them.” Four wild-eyed rooks, biting their kite-shaped shields in a battle frenzy, present some of the biggest clues. 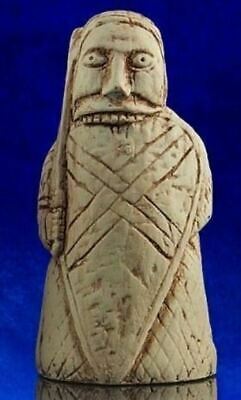 A year after the public unveiling of the Lewis Chessmen, the British Museum’s Frederic Madden recognized the figures as “berserkers”—fierce Viking warriors of the Norse god Odin—based upon his knowledge of Icelandic sagas. “The berserkers are probably the only images of what people back in that time thought the Vikings looked like,” Brown says. 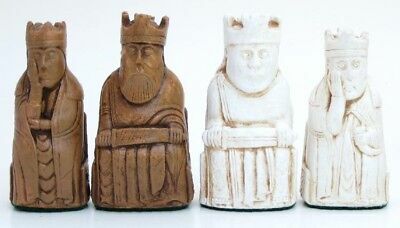 Conventional wisdom among scholars, however, grew that the Lewis Chessmen were likely crafted in Trondheim, Norway, which in the 12th century was home to highly skilled craftsmen, wealthy patrons who could afford expensive carvings. 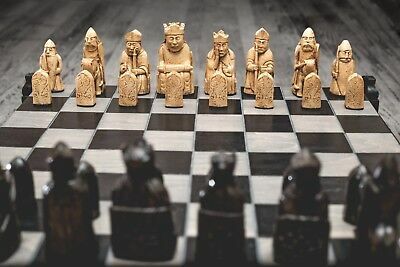 In 2010, Icelandic natives Gudmundur Thorarinsson and Einar Einarsson garnered newspaper headlines by resurrecting Madden’s theory and pointing to passages in Icelandic sagas that mention the use of bishops in chess games. 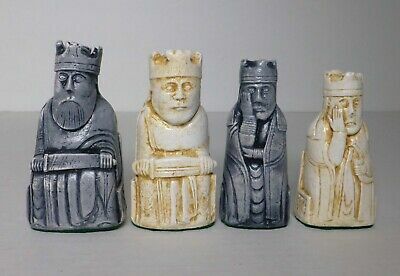 After mining Icelandic sagas, archaeological studies and the history of board games and Viking trade routes, Brown also concluded that it was quite possible that the Lewis Chessmen were products of Iceland. 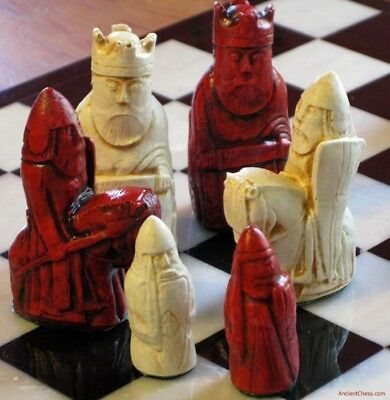 Brown theorizes that the chess pieces were commissioned by Pall Jonsson, a bishop of Skalholt who was educated in England, and crafted by a woman named Marget the Adroit, who according to Icelandic sagas carved so skillfully that no one in Iceland had seen such artistry before.” “She was considered one of the best artists of her time. The bishop hired her to beautify his church, construct altarpieces and make luxury gifts to send to friends abroad,” says Brown. These lavish artworks included ceremonial crooks that the bishop sent to his counterparts across Scandinavia between 1195 and 1211, a golden age of Icelandic artistic creativity. 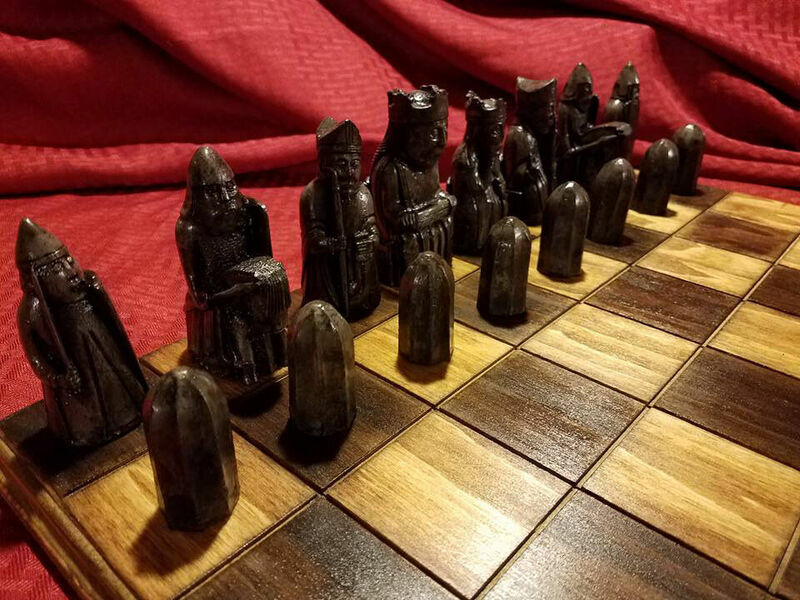 Brown says no archaeological proof has been found that Vikings played chess, but there is a description of them doing so in the sagas. 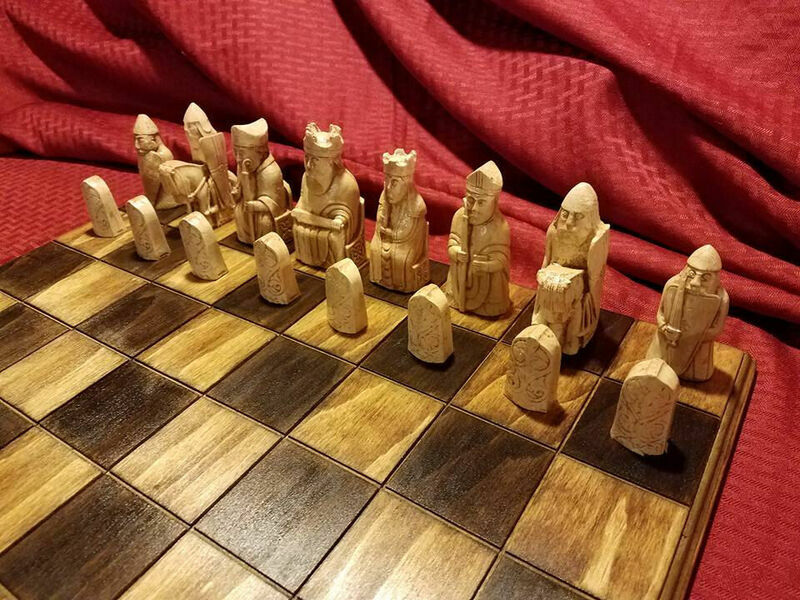 “At the time the Vikings were raiding Europe, people were playing chess in those places so they certainly could have learned about the game and brought it back with them,” she says. 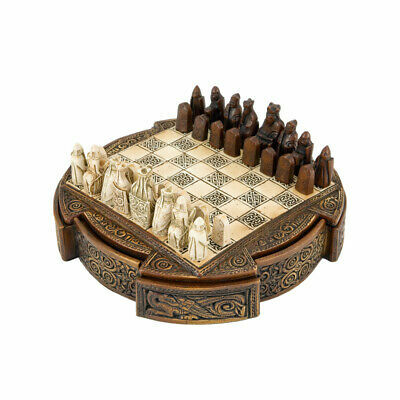 Brown adds that the types of pieces crafted for the chess set give us insight into how 12th-century Scandinavians viewed their predecessors. 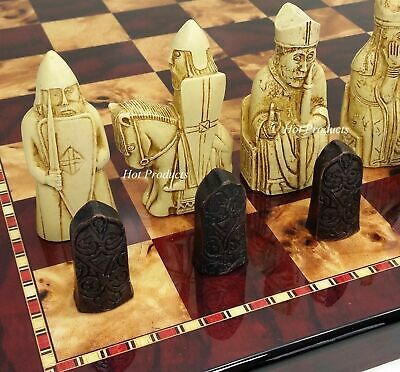 “The people making them showed no reason not to stick a Viking fighter and a bishop in the same game. 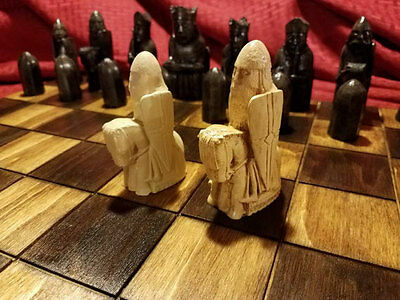 There was no tension between the pagan warrior and Christian symbol fighting on the same side.” Scholars are unsure if the chess pieces ended up on the remote island after a shipwreck or were buried by a traveling merchant or an island resident. Brown says, however, that their presence on the Isle of Lewis speaks to the surprising interconnection between the British Isles and Scandinavia during the Viking Age and beyond. 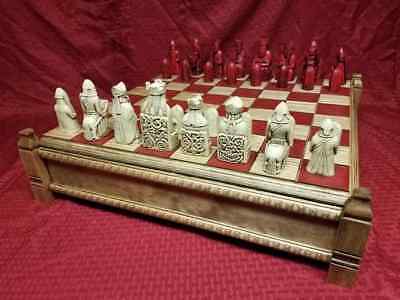 “The Norse Scandinavian influence was heavy in the British Isles until 1266, so these chessmen are probably a sign of this common culture. Places we think of being far apart were actually well-connected. Iceland was not on the edge of anything. 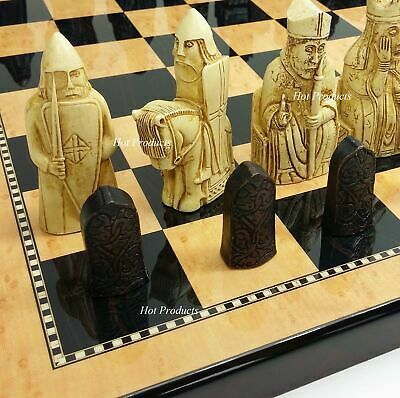 It was pretty central to the luxury trade of the Vikings and through the 13th century.” Most of the Lewis Chessmen reside in the British Museum, while 11 are kept at Edinburgh’s National Museum of Scotland. The rise of Scottish nationalism in the previous two decades has brought with it cries to return what some consider Scotland’s greatest archaeological treasure back to the place of its discovery. 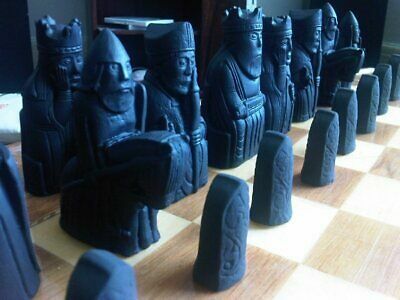 Through a loan agreement with the British Museum, the new Museum of the Western Isles in Stornoway will receive six of the chess pieces. 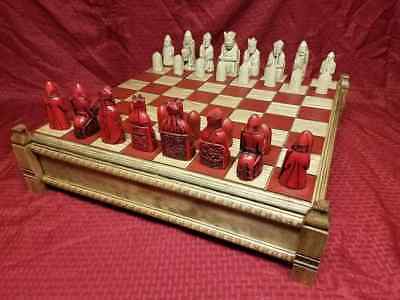 Condition: "Full Size Reproductions, not the smaller set sold everywhere else. Seller - 268+ items sold. 4.4% negative feedback. Good seller with good positive feedback and good amount of ratings. 268+ items sold. 4.4% negative feedback. Good seller with good positive feedback and good amount of ratings.